The Basenji, commonly known as the "Barkless Dog", is a small athletic dog with many unusual traits. Short-haired with a wrinkled forehead. 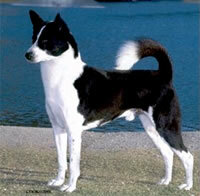 The keen eyesight and remarkable scenting ability of the Basenji means they hunt using both sight and scent. A high energy dog who enjoys such activities as lure coursing, tracking, conformation, obedience, and agility. 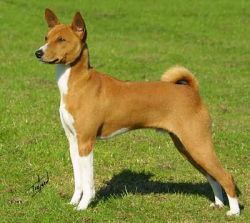 One of the oldest breeds, the Basenji appeared on ancient Egyptian engravings dating back to 3600 BC. They were preserved in their native land of Central Africa where they were highly regarded for their intelligence, courage, speed, keen scenting ability, and silence. They do not bark but instead make yodelling sounds. They are somewhat cat-like in their mannerisms, in so much as they are frisky, agile, and cleans themselves like a cat does. The Basenji is an intelligent, independent, but affectionate and alert breed. Known to be aloof and cautious with strangers, calm and gentle with friends, and loving with children. The Canaan Dog is a medium-size, robustly made, Spitz-type dog which has been indigenous to the region encompassed by modern Israel for centuries. The Canaan Dog (Kelef K'naani) is a breed of dog known for its intense barking, trainability, and survival abilities when food and water are scarce. The coat is short to medium in length, harsh, and straight and may be white with large spots in either black, red, or brown or it may be all brown or all black with or without white marks. The ears are medium-sized, pointed, and held erect. The tail is plumed and usually held curled over the back. The eyes are dark-coloured. The adult dog stands 48 to 61 centimetres tall at the shoulder and weighs 16 to 25 kg. The breed was developed during the late 1930s as a guard dog for kibbutzim and trained for mine detection in the Second World War. Has also been used as a guide dog for the blind and as a search and rescue dog.